Get ahead with midweek cooking with a big batch of classic chicken stew. Just sprinkle over the herby breadcrumb topping when you’re ready to serve. Heat a glug of oil in the casserole and gently fry the shallots, covered, for 10 minutes, stirring occasionally. Meanwhile, heat a glug of oil in a large frying pan over a medium heat and fry the chicken for 5-6 minutes until browned, then transfer to a plate. 2 minutes. Stir in the flour and cook for 1 minute, then add the wine and bubble to evaporate most of it. Stir in the stock, bring to the boil, then add the browned chicken with the rosemary, thyme and carrots. Turn the heat to low, cover and simmer for 45 minutes. Meanwhile, combine all the ingredients for the herb crumb topping and season. Divide two thirds of the stew among 6 bowls, sprinkle with the topping, then serve with crusty bread, if you like. Make the stew up to 2 days in advance. Keep in a sealed container in the fridge and reheat until piping hot. Use the remainder from this recipe to make the tagine. Our friends at Majestic Wine recommend Definition Gruner Veltliner. 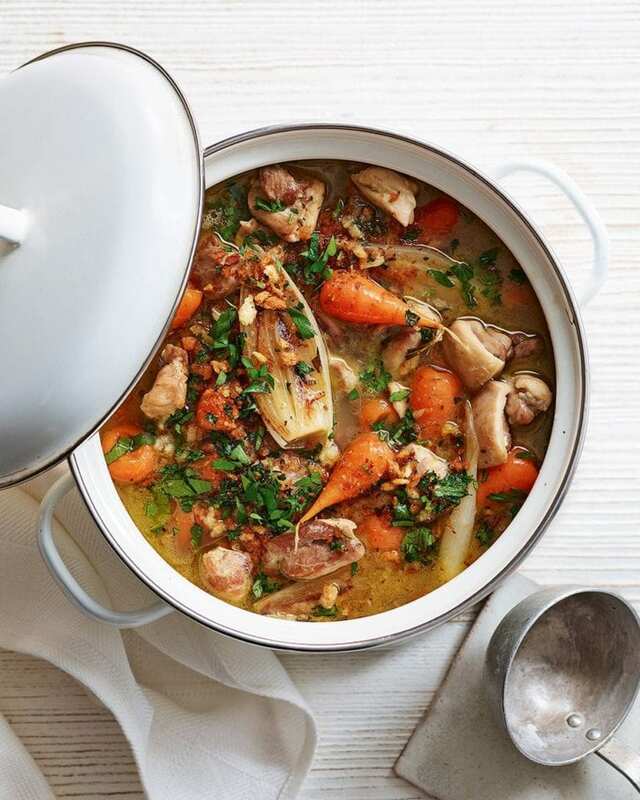 Its mouthwatering acidity is the perfect foil for this hearty chicken stew.